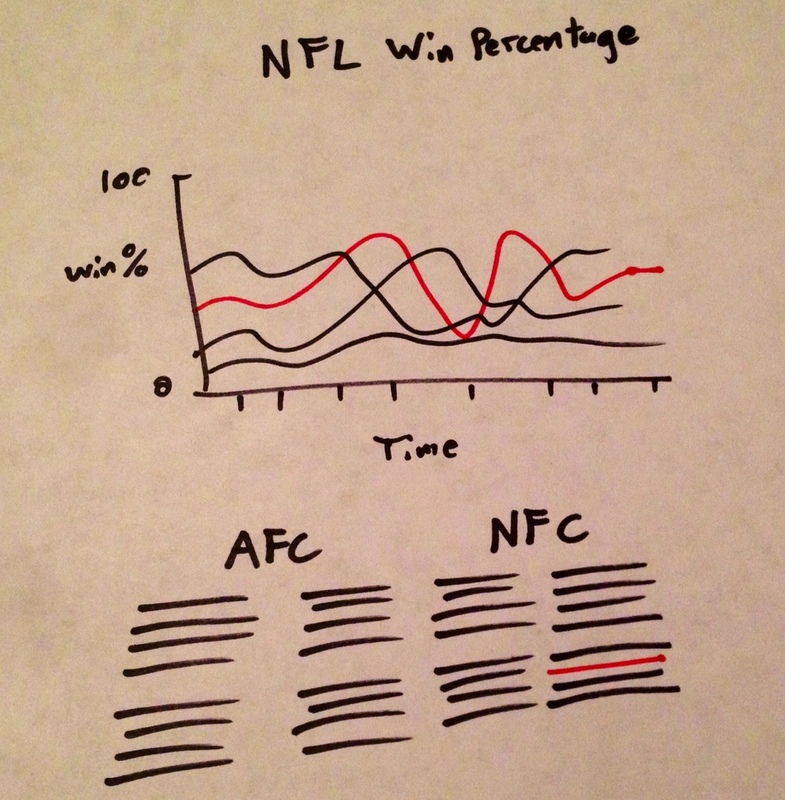 Tonight I’m going to start working on an idea I had for an interactive chart of NFL win percentages. The idea came to me when thinking about the Detroit Lions and how bad they are. I wondered if they had always been this bad or if it was only recently. 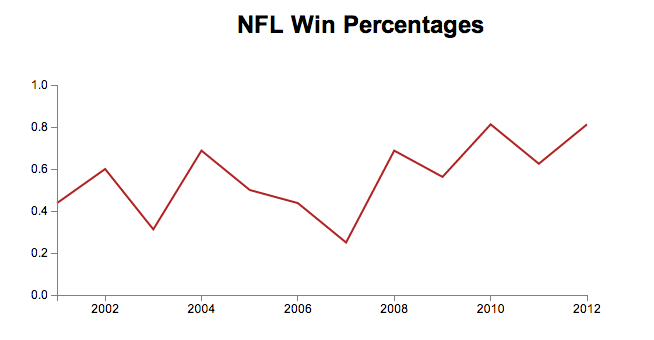 (Hint: Always) So I thought it would be cool if I could look and see every team’s win percentage for each NFL season going back in time. Here is a 30 second sketch of what I am thinking. Lots of lines, the ability to make one stand out and some sort of grouping of teams so it is easy to turn them on and off. This is my first project running D3 from my server and also my first time developing on a local web server and then pushing the code to my regular server through github so I’m bracing for the unexpected. A few minutes later… that was actually pretty easy. The nice part of developing an interactive visualization like this and pushing commits each time I get it working is that I can rewind if I ever need to. Tonight I walked through a tutorial to get a basic line chart working in D3. The data is all loaded from a separate file which is the main goal. 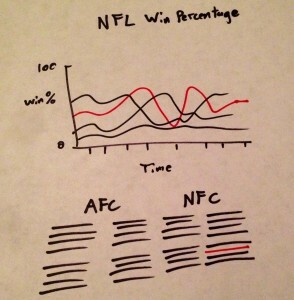 As I update the data in that file, the chart will update. I might explore loading data from an sports data API at some point, but for now this seems like one less level of complexity. As of tonight, what I’ve finished looks like this. 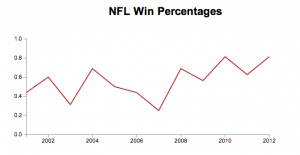 It is the last 12 season of the Atlanta Falcons. I figured that was a good place to start. If you visit this page in the next week or so, you’ll be able to see something that looks like that live (assuming nothing breaks). If you wait longer then a week though it might look different. Because this graphic is D3, it is rendered live when you visit the URL. S0, once I start working on it again, the version you will see at that link will be the most up to date one and it might be very different.